Big Seance Podcast: Podcast Awards Announcement! Daily Votes are Needed! Your help is needed, because votes from YOU, the listener, the #paranerd, will determine the winner. Voting is now open, and ends on June 12th. 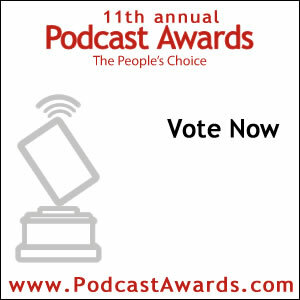 You can vote EVERY DAY by going to PodcastAwards.com. As I mentioned in the video I shared online, if you have friends who would love to help us by voting, or even sharing the video, for that matter, that would be awesome. Maybe they’ll find a new podcast to listen to in the process, even if it’s not the Big Séance. That is one of the cool bonuses of the podcast awards… it promotes this growing medium. In the video, I decided to include highlights of past guests and episodes from the last 2 years. It was kind of fun. So just to recap, go to PodcastAwards.com today (and if you’re REALLY a #paranerd, every day until June 12th, 2016.) And as always, vote or no vote, my #paranerds rock. Please help The Big Séance Podcast by subscribing, rating, and reviewing the show on iTunes, TuneIn Radio, Stitcher, or Google Play Music.